A while ago I checked out The Revenant (2015) with my better half Cuteness Everdeen Sarah. We both love Leo and the blockbusters he churns out in rapid succession, which is why we couldn't miss out on the movie that finally earned him an Oscar. The epic historical survival Western was directed, co-produced and co-written by Alejandro G. Iñárritu, best known for 21 Grams with Sean Penn (2005), Biutiful with Javier Bardem (2010) and Birdman with Michael Keaton (2014). The Revenant is based on Michael Punke's book of the same name. The year is 1823. Frontiersman Hugh Glass (DiCaprio) is a part of Captain Andrew Henry's (Domhnall Gleeson) party of trappers through the Dakotas. When the company's camp is attacked by a hostile Arikara war party, nearly all of the trappers are slaughtered, and only a handful of survivors manage to escape, forced to abandon most of their valuable pelts in the process. Besides being hunted by the Arikira, their goal of travelling to Fort Kiowa is complicated when Glass stumbles upon a mother grizzly bear and is mauled to near death. Henry then offers money for anyone to stay behind with Glass in case he recovers or dies on his own. The volunteers are Hawk (Forrest Goodluck), Glass's half-Pawnee son, Jim Brider (Will Poulter) and John Fitzgerald (Tom Hardy). This one was, well, grizzly from start to finish. 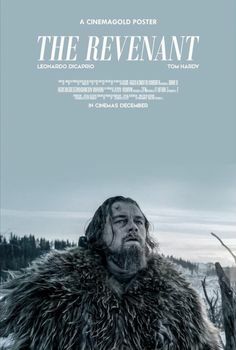 Starkly beautiful and uncompromising, The Revenant offers punishing challenges for DiCaprio's Glass, resulting in an absorbing survival drama that has something for everybody.